Oviedo High School Best Supporting Actor Golden Bananas Award, 2008. It was awarded to Dane Kolb for his performance as The Wizard in the Oviedo High School Theatre Department's production of the musical comedy, Once Upon a Mattress. Original 6 x 18 inch trophy: Oviedo High School Golden Bananas Award for Best Supporting Actor, Dane Kolb, 2008: Private Collection of Dane Kolb. 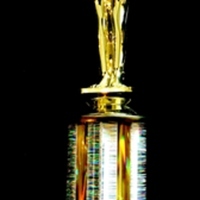 Digital reproduction of a 6 x 18 inch trophy. Oviedo High School, Oviedo, Florida. Originally owned by Dane Kolb. Copyright to this resource is held by Dane Kolb and is provided here by RICHES of Central Florida for educational purposes only. Best Supporting Actor, Dane Kolb, OHS Golden Bananas, 2008. Oviedo High School. “2008 Oviedo High School Golden Bananas Best Supporting Actor Trophy.” RICHES of Central Florida accessed April 21, 2019, https://richesmi.cah.ucf.edu/omeka/items/show/5204.